Our plan for Sorrento included a day trip to Positano, but we didn’t make it. 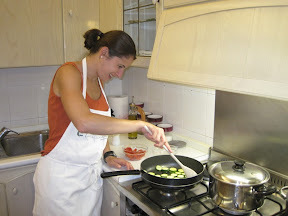 We arrived in Sorrento around 2 p.m. and had a 6 p.m. cooking class. The bus ride to Positano is an hour each way, so we simply could not do both. Ah well, whatcha gonna do? Well, we ate pizza! Since Campagna is the home of pizza it seemed fitting we have our first one of the trip there (I know, I know, I’m in Italy for four days and it’s only my first pizza? Oy vey). Okay, so the cooking class, it was amazing. Yeah, yeah, I say everything is amazing, right? Well, I gotta say, this experience was in my top 10. We arrived at the beautiful Villa Adriana Guesthouse a hair early, so our hosts greeted us with an apertif of presecco. 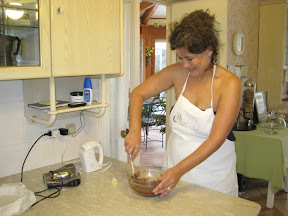 Lisa found the Sorrento cooking classand needed one more participant to get the booking. Most activities on trips like ours require at least two persons to secure. It can be quite difficult when traveling solo. When she emailed me the menu of seafood, seafood and more seafood, I happily committed. A few adjustments were made to the list after we booked and the mussel dish was aborted. I was heartbroken. I heart mussels. I emailed and asked if they could please please please add it back to the menu. I wasn’t optimistic when we arrived, but much to my utter joy they’d made some changes to our pasta dish to accommodate my mussel adoration! Suh-weet!The owners, Andrea and Valerio, are a lovely young couple. Andrea is a spunky Aussie transplant who abandoned a marketing gig down under to live in Sorrento (gives me some ideas…they do say mimicking is the highest form of flattery…). 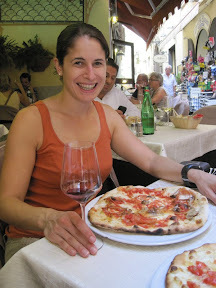 She met Valerio, a Sorrento native, and they now divide their time between Australia and the Sorrento guesthouse. It was handed down from his parents who thought it was getting too big. Not too shabby! The guesthouse is the home where Valerio grew up! He described in detail the way the kitchen and the sun room were decorated in his childhood. 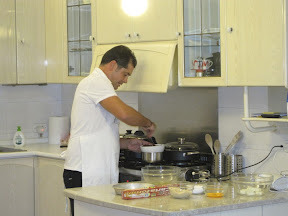 Nearly all of the recipes are from his mother, Adriana. Though, the fabulous pasta dish was Andrea’s brainchild. 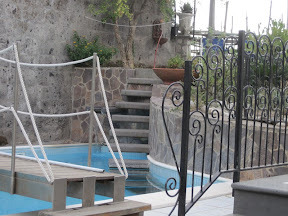 The couple opened the guesthouse two seasons ago and have been booked solid ever since! We couldn’t get in and were even more disappointed when arrived. The B&B is a few blocks off the main strada (street). The older I get the more I have come to appreciate peace and quiet at my hotel. This tranquil setting would have truly been perfecto. Okay, okay, so on to the cooking. What an incredible experience! Even Lisa says it was above and beyond. Being my first cooking class I had nothing to compare it to while Lisa has been taking classes throughout Italy for three years. 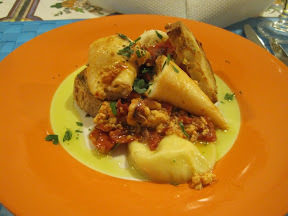 Our menu included a pasta of mussels, zucchini, tomatoes and garlic, a stuffed squid — with three kinds of cheese! — and a Torte Caprese for dessert. Hit me up on Twitter, @valeriekq, if you want the recipes. We started the right way — dessert first! 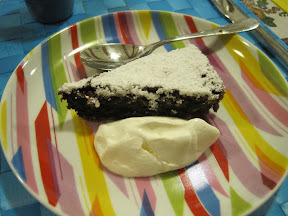 We whipped, beat and mixed the ingredients for a traditional flourless chocolate cake called torte Caprese. The local dish originates from the nearby isle of Capri. It’s an amazing selection if you need a dessert free of flour. It includes peeled walnuts. They can be done with the skins for a more bitter taste; apparently that is Adriana’s preference. Valerio decided since I was new to the cooking lesson game I would get the hardest part, folding the whipped egg whites into the chocolate mixture. He roots for the underdog, he said…no pressure…(okay, maybe I was a little nervous!). 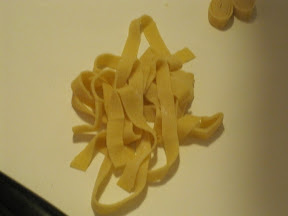 Next, armed with flour, oil, an egg and a pinch of salt we moved on to pasta-making. Who knew I already have all the ingredients in my kitchen!? 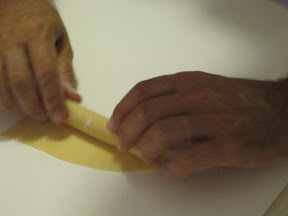 Next we started the sauce for the stuffed squid and the pasta. I got to flip and toss the veggies in the sauce pan! I also learned a few tips on garlic: it’s important to never heat up the oil before adding the garlic because it is porous and burns easier. 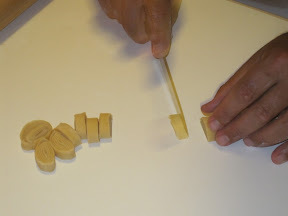 We mixed the cheese, stuffed the squid, then rolled and cut the pasta. 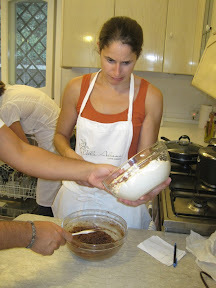 With such lively and knowledgeable hosts it’s no wonder Villa Adriana is always booked! 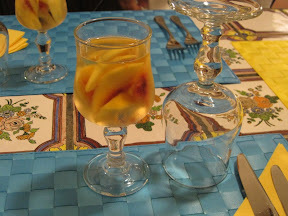 As the food finished they ushered us off to the sun room with a bottle of wine; white served the traditional Sorrento way includes cut up fresh peaches in the glass. It was so refreshing! I am so doing that at home. 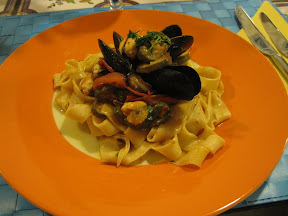 After a few minutes a steaming dish of pasta, mussels and veggies was placed in front of us. We eagerly dove in. It was decadent! The mussels melted in my mouth, everything tasted so delicate and the wine complimented it perfectly. With every bite we were more and more enamored with our creation — our creation! I couldn’t believe I actually made this! Next came the stuffed squid. Um, wow. That is all. Now, before they would serve us dessert Valerio insisted we have a digestivo. He brought out homemade limoncello, homemade limoncello with mint, pomegranate, local drinks, on and on and on. Pretty soon it felt like we were sitting around with old friends drinking, talking, laughing. Andrea announced she could not indulge because she is expecting a bambino in March! We stayed for another hour or so, gobbled up our torte caprese, then finally hugged and kissed our new Sorrento friends good-bye…with promises of returning next year for a few nights at the B&B and another cooking class! If you’re in Sorrento, hit this up. You won’t be sorry! Ciao Ciao! 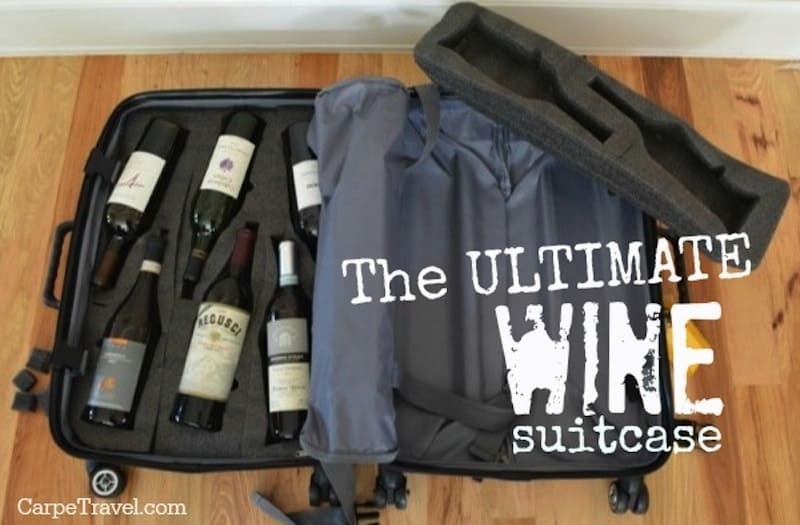 Time to hit Tuscany. Florence, here we come. Loving the information on this website, you have done outstanding job on the articles. You could certainly see your expertise within the work you write. The world hopes for even more passionate writers such as you who aren’t afraid to mention how they believe. At all times go after your heart. “Faith in the ability of a leader is of slight service unless it be united with faith in his justice.” by George Goethals.